Like the Pyramids, the building of the Great Wall was a magnificent accomplishment that took hundreds of thousands, if not millions of men to achieve. That’s a little something for you to keep in mind while you’re on your Great Wall tour. The gigantic undertaking of building The Great Wall required a large quantity of manpower in the building site and the logistics department. The manpower mainly came from three sources: garrison soldiers, drafted civilians and starving masses, and exiled prisoners. A. Soldiers: From The Great Wall of Emperor of Ying Zheng to the grandest one built during the Ming Dynasty, soldiers were the main constructive body. The Great Wall of Emperor Ying Zheng was built over nine years by the 300,000 troops that has been directed by General Meng Tian and beaten off Xiongnu. The well-kept site in Guyang County of Inner Mongolia proves that but for troops the construction in grand ravines and canyons would be impossible. The Han Great Wall was built mostly by garrison soldiers. In a poem written by Chen Lin, one of the seven famous poets in the last years during the Jian An Period of the Eastern Han Dynasty, there is a lien that reads, “True men would rather die in the dust than build The Great Wall in gloom”, which expressed the soldiers’ emotion of the time. The Great Wall of Northern Qi was also built by garrison soldiers. In order to pacify them the regime even married widows in the rear area to them. The boundary moat from the southwest and the northwest of Jinxiu to Taizhou along Linhuang was built by 30,000 soldiers in successive years. The Ming Dynasty provides the best example. During the period The Great Wall construction was a most important duty of the garrison soldier. Each period of construction would involve a large number of soldiers. B. 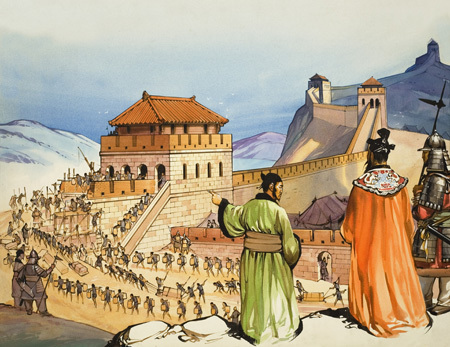 Civilians: In all ages civilians were called up in large quantities for construction on The Great Wall, always amounting to tens of thousands, or even a million at a time. During Emperor Ying Zheng’s reign, besides the 300,000 thousand troops that were maneuvered, more than 500,000 civilians were also mobilized. During the Northern Wei Dynasty, for building the defensive line in the frontier, 100,000 civilians were called up from Sizhou, Youzhou, Dingzhou, and Jizhou prefectures. The Northern Qi Great Wall from Xiakou to Hengzhou involved 1,800 civilians. The Sui Great Wall from Yulin in the west to Zihe in the east in today’s Inner Mongolia was constructed by more than 1,000 civilians. During the moat construction in Linhuang of Jinxiu in 1198, besides soldiers and civilians, starving masses were also aroused. C. Prisoners: Exiled prisoners were a frequent supplement to The Great Wall construction. During the Qin and Han dynasties, there was a penalty called “rampart construction” that would send prisoners to the construction site for four years. It was stipulated when Emperor Ying Zheng ordered to burn books that those who failed to burn the banned books within thirty days would be shaved bald, ringed around the neck and banished to the frontier to build The Great Wall. At this time a penalty of this kind was heavy. At the frontier the prisoners had to prepare for combats in the daytime and to build The Great Wall at night. Among the laborers constructing The Great Wall, quite a number of people were prisoners. Shuntian Imperial Inspector Yang Zhao recorded in 1571 Memorandum on Armament of Frontier Strategic Towns that prisoners from all prefectures were sent to build The Great Wall, whose working time would be converted into their prison term; when the prison term was completed with enough amount of labor, they would be released.